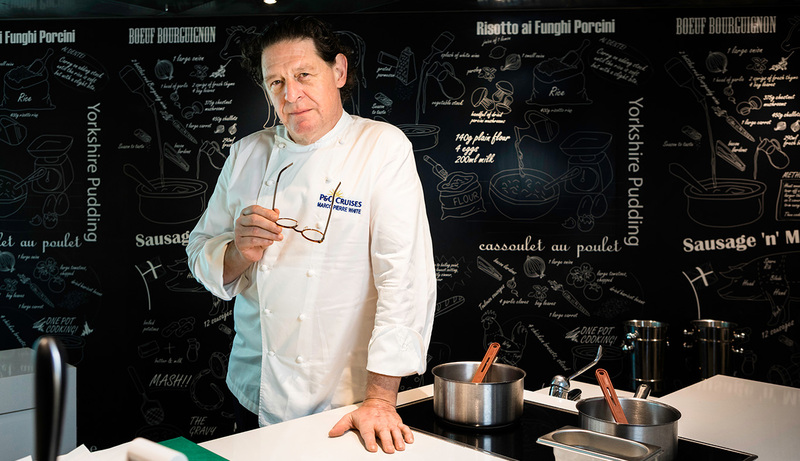 Cooking aficionados should start getting excited as P&O Cruises has revealed that the enfant terrible of the UK restaurant scene, Marco Pierre White, is set to take over its famous Cookery Club. P&O Cruises’ Cookery Club invites famous chefs to share their expertise in the kitchen with passengers through classes and demonstrations. And in Marco Pierre White, the youngest ever chef to be awarded three Michelin stars, let’s be honest, they’ve scooped one of the biggest names in cooking. Guests on six selected cruises will have the opportunity to join one of Marco’s ‘Hosted Masterclasses’ where you’ll be able to cook classic English dishes alongside Marco before sitting down to enjoy them together. Or if you’d rather be prepared food than cook it yourself, you can enjoy ‘Marco’s Hosted Dinners’ where guests can dress up, sup a cocktail and watch the master in action before dining with the great chef himself. And, if Marco isn’t onboard, you can still get a culinary education with his collection of ‘Unmistakeably Marco’ lessons taught by the talented ship team who’ve been under the tuition of Pierre White himself. “Teaching is my passion, it is about telling stories and inspiring confidence. The simplest dish, cooked well and using great local ingredients, will create love round the dining table,” said Marco Pierre White.